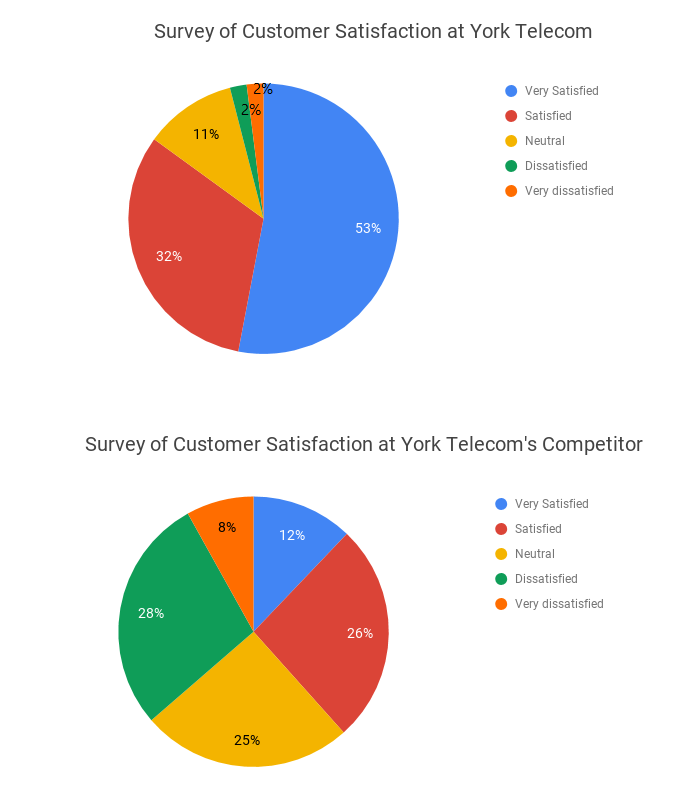 The pie charts below show the results of a customer satisfaction survey comparing the performance of York Telecom and a competitor in April. The pie charts depict the results of a customer satisfaction survey for two telecom companies in April as compared to an industry average benchmark. Overall, while customers of York Telecom reported satisfaction beyond the industry average, their competitor had clients who were more dissatisfied with their telecom company than the average telecom’s customer. According to the industry average, around two thirds of the telecom industry’s customers were reportedly either satisfied or more with their level of service. Those with no opinion accounted for 10%, whereas dissatisfied people made up exactly a quarter of all those surveyed. In April, York Telecom clearly was doing something right. Customers reported as being satisfied or above comprised 4 out of 5 of all customers, while only 4% were recorded as unhappy with their service. In stark contrast, York’s competitor’s results were more diverse with over a third of people happy with their service, and an equal number of customers unhappy with the company. A quarter of those surveyed were neither satisfied nor unsatisfied with the competitor’s performance in line with the industry benchmark. Customers at York Telecom were overwhelmingly supportive of the company compared to the industry benchmark, whereas those of the competitor showed levels of satisfaction beneath the industry average. Despite not knowing the year surveyed, past tense should be used. The overall trend is that York Telecom appears to be performing above industry expectations. Then give further details to support this trend. “Stark” means severe in nature (complete). York’s competitor had a greater range of opinions associated with it. The subsequent details mentioned show this diversity, while the quarter who have no opinion match the industry standard. This paragraph gives a lot of comparisons, trends, and is easy to follow. The pie chart depict the result of a customer satisfy survey for two telecom company in April as compared to industry average benchmark. Overall, while customer of York Telecom report satisfy beyond the industry average, their competitor had client who were more dissatisfaction with they telecom company than average telecom customers. According the industry average, around two third of the telecom industry’s customers were reported either satisfied or more with they level of service. Those with no opinion accounted 10%, whereas dissatisfied people made exactly a quarter of all those surveyed. In April, York Telecom was clearly doing something right. Customers report as being satisfied or above comprised up 4 out of 5 of all customer, while only 4% were recorded as unhappy with they service. In stark contrast, York’s competitor’s results were more diverse with over a third people happy with their service, and equal number of customers unhappy with company. A quarter those surveyed were neither satisfied nor unsatisfied with the competitor’s performance in line with the industry benchmark. Overall, while customers of York Telecom reported satisfaction beyond the industry average, their competitor had clients who were more dissatisfied with their telecom company than the average telecom customer. In April, York Telecom was clearly doing something right. Customers reported as being satisfied or above comprised 4 out of 5 of all customers, while only 4% were recorded as unhappy with their service. In stark contrast, York’s competitor’s results were more diverse with over a third of people happy with their service, and an equal number of customers unhappy with the company. A quarter of those surveyed were neither satisfied nor unsatisfied with the competitor’s performance in line with the industry benchmark. Since you need to compare the data, which pie chart would you compare against? If we use the industry standard for this, what are the largest/smallest segments? How can this data be grouped together for ease of description? Look at the pie charts for York Telecom and their competitor. What are the largest/smallest segments for York Telecom? How do they compare against the Industry average? How about York’s competitor’s survey results? Consider grouping satisfied and very satisfied customers together to make one statistic and dissatisfied and very dissatisfied to make another.